Survivor Leslie (l) with Jean-Marc Todeschini and Ambassador H.E. Jean-Pierre Thébault. Today 11/11 we pause to recall the horrors of war ensuring the shared memories prevail in a time of fresh refugee crisis and border unrest. 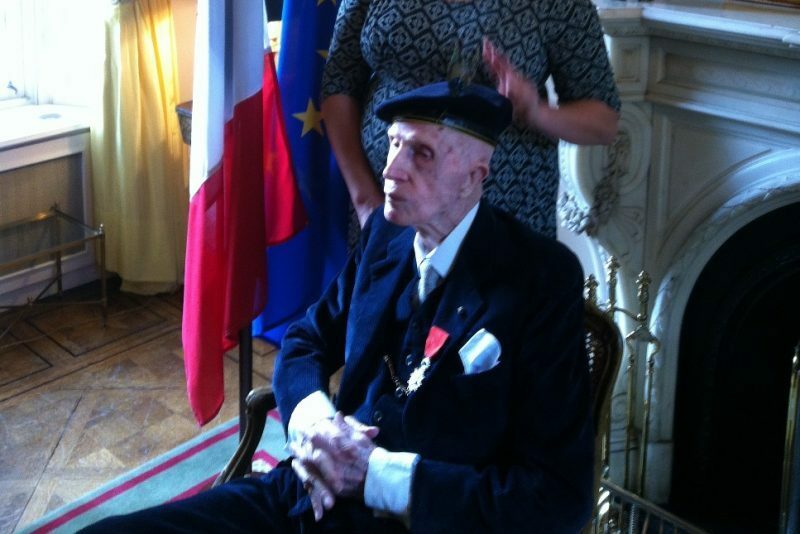 France’s highest honour, the Légion D’Honneur, was bestowed upon Sir John Leslie, WWII veteran by Jean-Marc Todeschini, France’s Secretary of State for Veterans and Remembrance in a champagne toasted ceremony at the French Ambassador’s residence in Dublin. Sir John Leslie, stood unwavering, immaculately clad in Navy, a feather in his beret, with perfectly shiny shoes and spoke clearly. In French, Jean-Marc Todeschini commended Sir John for his actions in an age of duty, an age of responsibility and commitment. Sir John was lauded for accomplishing something exceptional and dedicating his life for the survival of others. The “gloriously eccentric” peer (as described by Senator David Norris) became a member of the 2nd Battalion of the Irish Guards in 1938. He is an author, war hero, art critic and raver who once publicly disassociated himself from British military in the wake of the Bloody Sunday killings in 1972. The medal was awarded as a medal of Franco-Irish friendship, bound by the horrors of the Battle of the Somme and WWII liberation. Sir John, known as Uncle Jack, now 98, smuggled messages encouraging swaps of unwell prison of war soldiers for German POW in secret notes to his first cousin Sir Winston Churchill, British Prime Minister at the outbreak of the Second World War. General de Gaulle and Churchill continued to fight for a free France for five years. Sir John was a POW for five years having been captured in Boulogne-sur-Mer. Being a slight-framed chap stood to him as the plump and less slim apparently perish more readily in the POW camps. He retains his delicate frame to this day. Sir John penned “Never a Dull Moment” – his memoir of life and war, lessons in history and tales of his commitment and enlistment. The French ambassador, H.E. Jean-Pierre Thébault was a delightful host for the event to a contingent from North and South of the border, Castle Leslie family and friends of “Uncle Jack”. His delightful niece reassured everyone he could still stand and keep a dutiful eye upon his throughout the ceremony. He still has a penchant for the good life and one to party.